We offer backcountry ski, boot, and skin rentals. Prices listed are per day for demo-quality gear. Details below on our current assortment. My wife and I are headed through SLC on Monday, April 23rd, and realized that it would make sense to ski some corn on Tuesday. We would like to rent some gear from you. What gear do you have available in the rental fleet? For her, boots size 24.5. Skis around 160-165 cm, 80-90 mm waist. For him, boots size 26.5 or 27.0. Skis around 170 cm, 80-90 mm waist. Please let us know as early as possible, as we need to start driving at around 10 am Monday to get to your shop by 4 pm-ish. Thanks! Hi Chris, we have a pretty broad selection of skis that will fit your needs. 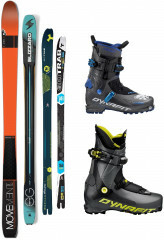 For boots, we currently have Dynafit TLT7 Performance in our demo fleet. Store is open from 11-6 every day. Looking forward to seeing you. My sister and I whant to rent full package Alpine touring ski for a few days on march 21th to 24th. How can we reserve full package ? Could you ship the package at our hostel (it's near from your place-Residence inn by Marriott) on march 20th at the end of the day ? Hey Alex, we strongly suggest you come in to try on the boots first, especially if you will be in them for 3 days.